Touch down in Ibiza and an overwhelming feeling comes flooding back to me. A feeling of excitement, anticipation and some what ‘belonging’ which I can never quite put my finger on. 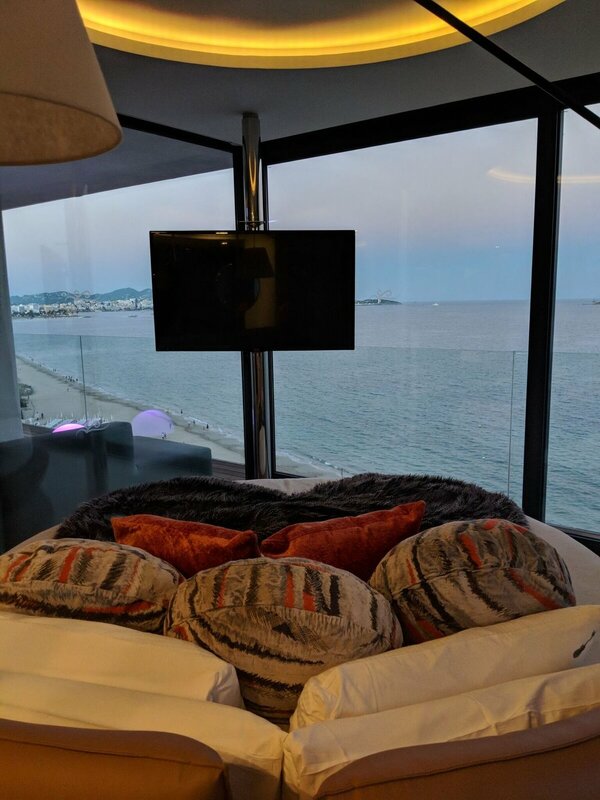 Ahead of launching their iconic 1,000 room hotel in London next spring, The Hard Rock Hotel Ibiza, set on the south side of the island, invited a small group of us out to give us an exclusive taste of what to expect…..Excitement was an understatement! As we drove to the hotel, our taxi driver tricked us into thinking the hotel was two hours away, so we prepared ourselves for a long and tiresome journey, but within no longer than 10/15 minutes he pulled up next to a huge ‘Hard Rock’ sign, on the doorstep of the infamous ‘Ushuaia’ club and muttered “ Only joking. We’re here!” I mean talk about convenience! International famous entertainers from all over the world find inspiration right here. We were given a memorabilia tour of the hotel, which was fascinating, so many famous acts have stayed or played here and costumes and outfits from Elton john to Lady Gaga to the beetles are all present in the hotel. Even the rooms are ridden with musical aspects. You can change the lights over your bed to change the mood, an amazing sound system is available and upon arrival were electrical guitars and vinyl players in our rooms. I mean, I wish we knew how to play both, but pretty cool huh? We were in our element. Beach bars, clubs, DJs, restaurants, events, sunsets, beaches, …well thankfully at the Hard Rock, this is all at your disposal. 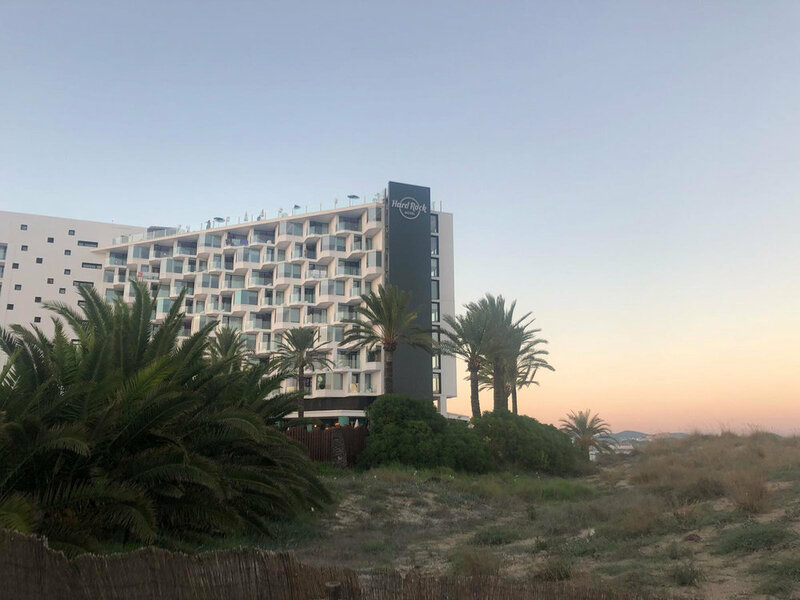 With the infamous Ushuaia next door, pumping beats and music throughout the day to get you in the mood, the hotel is set against the very famous El Chiringuito Beach. A ten minute drive and you’re at the famous Experimental beach bar, famous for its beautiful sunsets over the island. Another 12 minute drive and you can get lunch at El Chiringuito beach bar , which is such a great atmosphere and the food is divine. A few minutes from the hotel’s doorstep and you can dance all night at the famous HII Ibiza where we danced all night long to Eric Prydz for his closing set…. or if you’re feeling lazy, just roll out of bed and you’re pretty much in Ushuaia, where you’ll find most of the best music acts playing from dusk until dawn. So the first night Jordan and I arrived we had dinner at the hotel’s beach club outside. The beautifully white washed rustic decor oozes all elements of chic amidst a gentle evening sea breeze. The ideal spot for a chilled dinner. We ordered the sea bass and vegetables which to this day, Jordan describes as ‘the best sea bass’ she has ever had. Freshly caught and beautifully seasoned, a definite must-try if you go! One of the afternoons we had lunch here as well which was just as delicious, with a wide variety of mediterranean options. Ps - Go for the Octopus at lunch. It is Fish-licious. 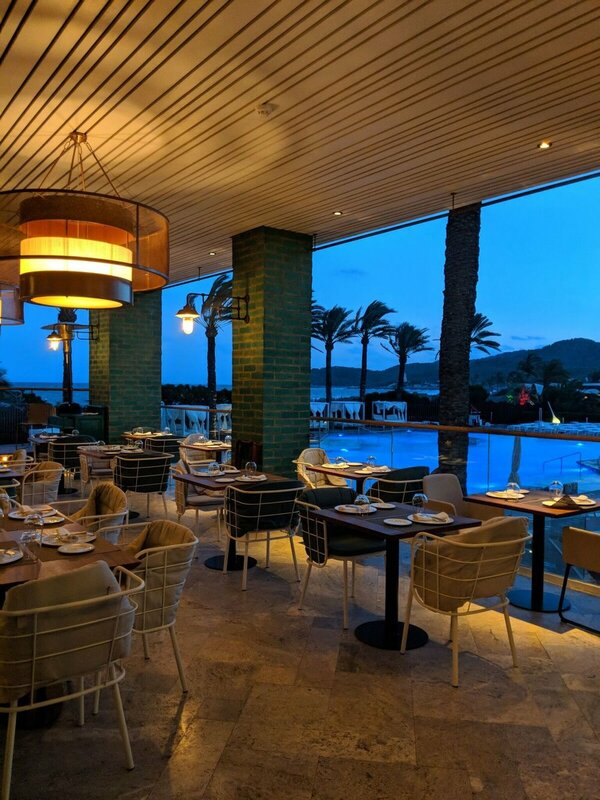 Now, if you’re looking for delicious cocktails, a fantastic sunset view, chilled beats and a way to start off the night, then the Hard Rock rooftop bar is the one. PS - Get the Old Fashioned cocktail. I’m not usually a fan of whisky , but theirs is special! So there you have it, if you love your music, you love to party and you love the magical island of Ibiza, The Hard Rock is the place to be. Fantastic food, bars, location, music and ambience. It’s all here baby! Thank you so much for our stay Hard Rock! We can’t wait for the opening of the London property!